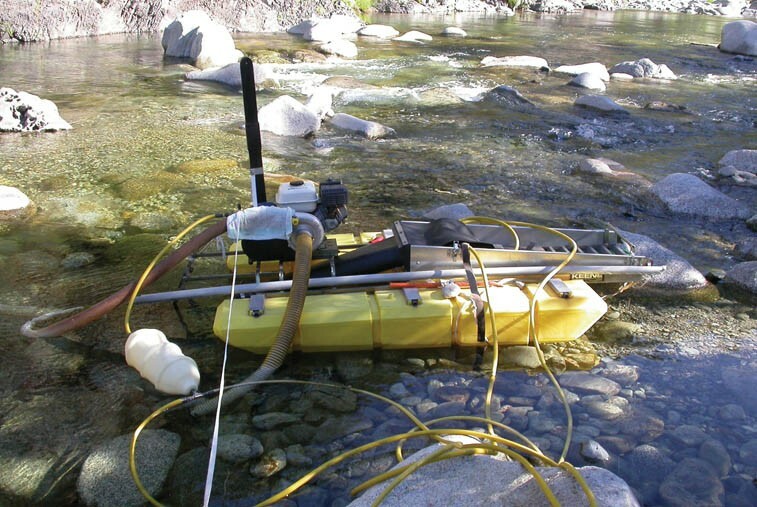 The California Department of Fish and Game has released draft amended regulations for the use of suction dredges in the state's rivers and creeks. While this means the ban on suction dredge gold mining, enacted a year and a half ago, eventually will be lifted, it does not look as if the new rules will extinguish the ire between gold miners and tribes and environmentalists. The DFG has been working on amending its 1994 suction dredge regulations for more than a dozen years now, and was spurred to complete the task in 2006 by court order after the Karuk Tribe sued the agency. The tribe said the existing dredge rules didn't protect species, such as the coho salmon and green sturgeon, in the Klamath, Scott and Salmon river watersheds on the North Coast that were listed under the Endangered Species Act after 1994. Dredging, they say, can entrain fish eggs and larvae, as well as stir up sediment that pollutes the water and in some cases contains toxic substances, such as mercury -- a byproduct of the old hard-rock mining days. DFG failed to meet the court-ordered spring 2008 deadline to make the new rules, and so in August 2009 Gov. Schwarzenegger banned dredge mining until the rules were completed. The proposed new rules, released Monday, Feb. 28, concern everything from the size of nozzles and hoses to dredging seasons. Earl Crosby, the Karuk Tribe's watershed restoration coordinator, said on Tuesday there's good and bad in the document. On the plus side, he said, the new regulations would expand the no-dredging zone radius around the confluences of numerous rivers and their tributaries in order to protect what are called thermal refugia -- cold-water zones where fish retreat when the mainstem of their river is too warm. Previous rules, set last year under the Clean Water Act, require a 300-foot no-dredge radius in order to restrict sediment pollution in the water; the new DFG dredge rules add 200 feet to that radius. On the down side, said Crosby, in some areas the proposed rules allow dredging at times that conflict with spawning fish. "And during these times they're open for dredging, you still have green sturgeon coming into the system, you still have the Pacific lampreys coming into the system," he said. He's also worried that some areas have been opened to dredging that used to be off limits, including Red Cap, Dillon and Bluff creeks, and much of the Salmon River -- a river of particular concern to the tribe. "You know, we just saw local environmental groups ask for spring Chinook to be ESA-listed, and one of the last places in the Klamath Basin where those fish go to spawn is the Salmon River," said Craig Tucker, Klamath Coordinator for the Karuk Tribe, last month. "So it's a classic example of a place where there's an at-risk population of salmon that needs to be protected." Tucker said that areas where mercury is in the sediments also should be off-limits to dredging. In late January, the United States Geological Survey released a report that affirmed what previous studies by the Karuk Tribe and others had hinted at: Dredging in places where there's fine sediment, and which are downstream from old-time mining operations that used mercury to extract gold from rock, releases the mercury trapped in the sediments. The mercury becomes methylmercury in the water column, floats downstream and is absorbed by fish and, presumably, by people who eat those fish. The USGS found higher levels of mercury in fish downstream from such dredging on the Yuba River. Mark Stopher, the DFG's Environmental Program Manager, said his agency knew the results of the USGS study before they were published and that they informed his agency's decision-making on the dredge rules. "We shall not issue a permit if it is going to be deleterious to fish," Stopher said. Crosby, however, worries that the DFG doesn't always have the final say. For instance, one proposed new rule says that dredgers must not disturb mussel beds -- but it's up to them to decide if they're doing that. "So, if you have so many mussels per square yard, [DFG] wants you to cease and desist and move the dredge to another location," Crosby said. "But that's not enforceable. I mean, if somebody finds their pay streak, I don't think they're going to stop just because they're mining through a mussel bed." All this talk over where or where not to dredge is just nonsense, says attorney James Buchal, who represents the New 49'ers club in these matters. "The Native American tribes, they have a bunch of, I would call, idiotic theories -- like, for example, about these so-called ‘cold water refugia' and that dredging hurts fish," Buchal said in a recent interview. "In fact, if you're mining, the fish will come up and swim around the dredge and they are happy about it. They tend to cluster around the bottom of it because, if the miners are sucking this stuff off the bottom of the stream, there are occasionally nice things in it to eat." He added that dredgers actually remove 98 percent of the mercury from the sediment if it's present -- and which would wash downstream, otherwise. He can't see why the USGS and others are hung up on the remaining 2 percent left behind. "In the context of ecosystems, is it better to remove 98 percent of it, or is it better to leave it there because it was a human being that was removing it?" he said. "I don't understand the fundamental logic of the attack." You can view the DFG's draft supplemental environmental impact report for the proposed new suction dredge rules at http://www.dfg.ca.gov/suctiondredge/, at the library in Eureka, and at regional offices in California (the closest one to us is Redding). The public comment period ends 60 days from Feb. 28. Public meetings are March 23 in Santa Clarita, March 24 in Fresno, March 29 in Sacramento and March 30 in Yreka.